In the same week that the courts have confirmed that a prosecution for corporate manslaughter will go ahead for bosses of JTF Wholesale after two men died from Legionnaires’ disease contracted from a display hot tub in one of their stores, the Health & Safety Executive has published updated guidance on control of Legionella in spa pools. With hot tub sales in the UK growing at more than 20% a year, their popularity among consumers appears unstoppable, which is resulting in many leisure and holiday rental properties installing spa pools. There has even been a trend for hot tub film screenings where large numbers of inflatable pools are installed in front of a giant screen for a whole new cinematic experience! This Jacuzzi boom brings with it a heightened risk of Legionella, hence the revised and detailed guidance being issued by the HSE. 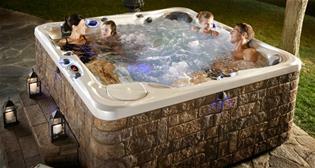 But why are hot tubs such a hotbed for bacteria? Spa pool water is usually held between 30°C and 40°C, which is the perfect temperature for bacteria growth. Below 20°C and Legionella is dormant and above 50°C it is killed off, but the thirties is just about spot-on for it to thrive and multiply. Not to put too fine a point on it, hot tub water is brimming over with delicious food for bacteria: scum, skin flakes, sweat, sun cream, mucus, saliva, hair and even (brace yourself) urine and faecal matter. This nutritious buffet provides an ideal food source for Legionella and since the water isn’t changed after each use, the concentration of particles is plentiful. If the hot tub is outside, there is also the potential for debris from the natural environment to get into the water, which again is a potential food source for the bacteria. This brings home the importance of a well-fitting lid for when the tub isn’t in use. Legionella bacteria infiltrates the body via the lungs, being breathed in while it’s floating around the air in the form of tiny aerosols of liquid. The bubbling action of a hot tub and the steam coming off the water means that anyone sitting in the spa pool or passing in its vicinity is likely to be breathing in the airborne water molecules. If they are carrying Legionella bacteria you risk contracting Legionnaires’ disease or other forms of Legionellosis. Spa pools are built using a system of pumps, pipes and filters, all of which have water in them or running through them. Keeping these well-maintained, clean and in good working order is essential to preserve the cleanliness of the water and reduce bacteria levels. A competent person must ensure that the equipment is serviced and tested regularly. A significant amount of chemicals is needed to treat the water and maintain the correct pH balance as well as to help control bacteria. Again, a trained and competent person needs to ensure frequent and regular testing of the chemical levels in the water and adjust dosing accordingly, and proper records must be kept. As the guidance affirms, “Communication and management procedures are particularly important where several people are responsible for different aspects of the spa pool’s operation. Responsibilities and lines of communication should be clearly defined, reviewed and documented to ensure they are effective, and documentary evidence made available for inclusion in internal and external audits. This also applies to external contractors who may be responsible for certain aspects of the control regime.” This includes ensuring that there is sufficient cover in place for when operatives are on holiday or off sick. Given this combination of risk factors and the exponential growth in hot tub sales, it’s obvious why the HSE has published new guidance. If you have a hot tub or are involved in managing or maintaining one for use by third parties, be sure to download your free copy here.